As per the Aadhar Statistics the Telangana population in 2019 is 38,472,769 (38.47 Millions) as compared to last census 2011 is 35,286,757. Growth rate of 9.03 percent of population increased from year 2011 in Telangana. till 2018.
on Feb 18, 2014, Lok Sabha passes Telangana state bill. on Feb 20, 2014, Rajya Sabha passes Telangana state bill. This newly formed Telangana State comprises 10 districts: Hyderabad, Adilabad, Khammam, Karimnagar, Mahbubnagar, Medak, Nalgonda, Nizamabad, Rangareddy, and Warangal. Capital of Telangana is Hyderabad. As the Congress Government discuss the contours of Telangana, India's 29th state, The option would be to bunch the 10 Telangana districts into a separate state which will have 17 Lok Sabha seats and 119 assembly constituencies. In that case, the rest of Andhra Pradesh will have 25 Lok Sabha seats and 175 assembly seats. Telangana State will have 10 districts. Adilabad, Karimnagar, Khammam, Mahabubnagar, Medak, Nalgonda, Nizamabad, RangaReddy, Warangal and Hyderabad District as Headquarters. Congress President Sonia Ghandi Finally pushed for announcement on formation of Telangana on 30th July 2013 at 7.20 PM. Telangana will be formed with 10 districts. Hyderabad is the Capital of Telangana in india. Hyderabad as Shared Capital for 10 or more years of the two states to be created out of the bifurcation of Andhra Pradesh. Telangana Rastra Samiti (TRS Party) formed by Mr. K. Chandra Shekar Rao in 2004 with main aim is to separate Telangana region from Andhra Pradesh and to regain regional autonomy as it existed before the formation of Andhra Pradesh State in 1956. As per Mr. Digvijay singh TRS will merge to congress for the elections of 2014. 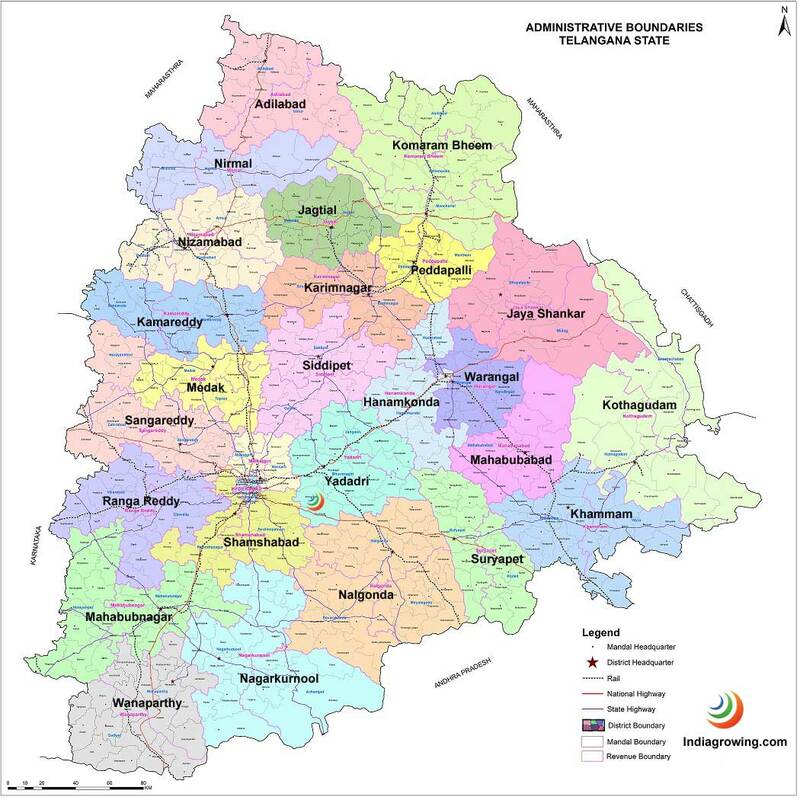 More news on Telangana Telangana new districts has been added to the site with all district maps.